Do you use your hunting knife frequently? Many hunters do. These small knives can make a big difference when it comes to cutting through the hunt. Starting from skinning your hunt to cutting the animal, these hunting knives can get the job done for you. 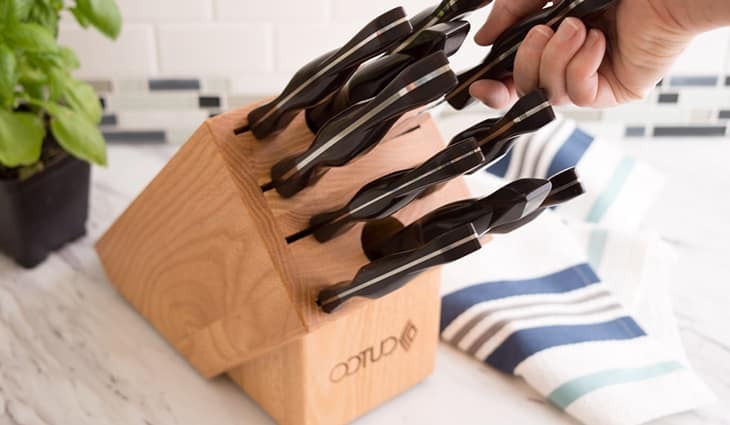 Although very handy, these knives have a common problem; the blades get dull very easily. Even if you have the best hunting knife, you are never assured that it’ll retain its sharpness over a long period. Hunters often face the problem of sharpening their knives every so often. This is a very frustrating thing to do. Due to this reason, many people often sharpen their hunting and survival knife with a specialized hunting knife sharpener. 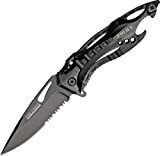 This is never recommended by knife manufacturers as this might permanently damage the cutting edge of the blade. There are other ways you can easily sharpen your hunting and survival knife easily at home, without the worry of permanently damaging these. We’ll now look into the steps which you should follow to sharpen your hunting knife properly without permanently damaging its cutting edge. Before you start, it is wiser to experiment with an old, rusty knife before you sharpen your main knife. This is recommended because you’ll need to get familiar with using the whetstone or the honing rod. Sharpening the knife at a wrong angle can damage your knife, which is why expert hunters recommend sharpening an old knife before you sharpen your main one. Maintaining a constant angle for sharpening the knife is very important. If you mess up with the angle, the final result will be a non-uniform cut. When sharpening, you should maintain a constant angle of 13 to 16 degrees with the whetstone. At first, you must soak the sharpening stone in water for about 45 minutes. Separate the stone from the water and apply a small amount of lubricating oil onto the sharpening stone. You may use mineral oil or honing oil onto the whetstone, diamond stone or the honing rod. This will make the process of passing the knife over the surface of the sharpening stone a lot easier. This will also reduce the number of steel shavings that persist. Before lubricating, you must ensure that you’ve read the manufacturer’s guidelines on lubricating. Some sharpening stones like the carborundum are designed to be used when these are dry or wet, but these get damaged when oil is put onto them. Hold the knife at the angle mentioned above. Slowly rub the knife through the side with the rougher grit of the whetstone or honing rod. This will chip off larger pieces of the knife, making the sharpening process a lot quicker. After a while, you can sharp the edge with the other side of the whetstone to ensure a finer finish. When you’re done with one side of the knife, flip the knife and start sharpening the other side. Make sure that you’re maintaining a specific angle while sharpening. Keep on sharpening till you get a smooth finish. The serrated blades are one of the main things that differentiate between your hunting knife and the common knife. These serrated blades can retain their sharpness longer than the cutting edges, but these can be harder to sharpen. You must use a honing rod to sharpen the serrated blades. To start, you must place the honing rod in the hooks of the blades. By maintaining an angle, you must slowly rub the knife onto the rod. Keep on rubbing until you get a smooth finish. It doesn’t matter if you have a Cutco hunting knife or a Japanese hunting knife, you can never ensure that these will retain their sharpness over a period. Even the best hunting knives can lose their sharpness. Although sharpening the knife with a specialized hunting knife sharpener may seem easier to do, it will cause permanent damage to the cutting edge of the knife. To prolong its lifespan, you can sharpen the knife at your home by following the steps mentioned above. You must ensure that you follow the safety precautions and slowly sharp your knife at the desired angle. This will not only save you some dollars but will also increase the lifespan of the knife. Once you’re set with your hunting knife, you’re set to go out and start hunting. Look out for the animals using your rangefinder or your scope, effectively aiming towards your target. And as you shoot the animal, you can approach the animal and process it on the go using your sharp hunting knife. 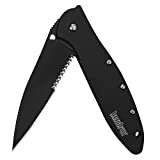 Kershaw Leek, Black (1660CKT) 3” 14C28N Sandvik Steel Blade and 410 Stainless Steel Handle, Both DLC-Coated; Featuring SpeedSafe Assisted Opening, Liner Lock, Tip Lock, Reversible Pocketclip; 3 OZ.